As with the Air France Flight 447 tragedy, much of the time air crashes are a confluence of events—a cascade of bad luck, bad decisions, inappropriate airline company policy, the failure of aviation regulators, and sometimes insufficient training, or various combinations of all five. 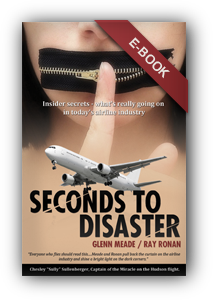 Seconds to Disaster will demonstrate that part of that bad luck is often aided by the airline industry’s own endless and aggressive pursuit of bottom-line profit which contributes to a creeping erosion of safety standards and puts both passenger and crew lives at serious risk. These revelations are made in the hope that any resulting debate will contribute to making air travel a safer experience for both crew and passengers alike. Seconds to Disaster will not only pose and answer questions as to why accidents happen, but also offer solutions as to how they can be further prevented. And it will explore a highly contentious issue: what parts do both the airline industry and the worldwide watchdog authorities responsible for governing that industry contribute in playing dice with passenger lives, through negligence and collusion.